New Light on the Arabian Religious Background of Islam? There is a key problem with our sources on early Islam. Aside from the Qur’an itself, all the sources we have were written down after the Abbasid Revolution of 750 against the Umayyads. The first author to compile a complete biography of Muhammad (d. 632), the chronicler Muhammad ibn Ishaq of Medina, was born around 704 and died sometime between 761 and 770. He may have been commissioned to write down his epic biography in the 750s by the Abbasid caliph al-Mansur. Much of what Ibn Ishaq alleges about the prophet contradicts the Qur’an, our only early seventh-century primary source for Muhammad’s life. Since it the account was composed 125-30 years after Muhammad’s death, out of materials that had long circulated purely in oral form, it was deeply shaped by later controversies and is anachronistic. 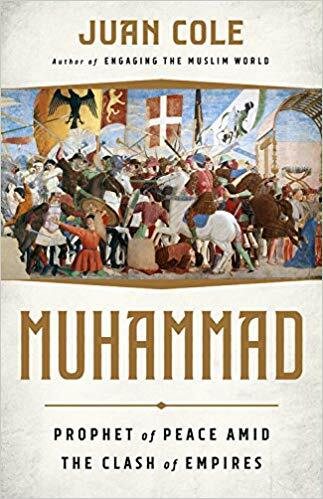 And, all the other classical biographies of Muhammad are even later and more problematic, some of them written down 200-300 years after his death. The Eastern Roman Greek sources and the Christian Aramaic sources do not say much about the Arabic-speaking peoples of Muhammad’s time. The later Muslim tradition depicts people in the Hejaz (western Arabia) as having still been mostly polytheists, though a few tribes were Jews or Christians. Still, the Arabs did worship a creator-God, just called “God” (Allah in the Hejazi dialect, Al-Ilah in Syria and elsewhere). 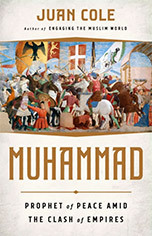 The Qur’an maintains that the Arabs of Muhammad’s era in Mecca acknowledged God/ Allah as the creator, but maintained that there were also other gods, including several daughters of God– Allat, al-`Uzza, and Manat (who had been equated by Arabs who lived in the Eastern Roman Empire with its Greek heritage to Athena, Aphrodite and Tykhe). Christian Arab sources in Greek of the 400s and 500s speak of the Arab (“Saracen”) tribes worshiping Aphrodite or Venus, by which they almost certainly meant al-`Uzza. The lack of early written sources has caused some modern historians to cast a great deal of doubt on the stories in Ibn Ishaq and his successors. One source that is only beginning to be explored by pioneers like Ahmad al-Jallad at Leiden is rock inscriptions in Arabic from the 500s forward. That there are thousands of rock inscriptions by Bedouin in late antiquity (many of them in Aramaic) has long been recognized, but it is only in the past few years that they have begun being found in Arabic with dates attached or other firm indications of their time period, for the 500s and 600s. Unfortunately, it is not clear where exactly in the Hejaz the inscription was found and it hasn’t been formally published by the Saudi archeological establishment. So caution is advised. What struck the publisher of the inscription was that it appears to derive from a time before Islam. At least the later Muslim sources repeatedly suggest that converts to Muhammad’s religion who bore what are called “theophoric” names, i.e. names that honored a god, changed them to mark their rejection of polytheism. The person who made this inscription was still named “servant of the Sun god” (`Abd Shams). (See also the canny comments in the Twitter thread of this posting). The Arabs of the 500s CE [A.D.] appear to have been henotheists. This is a notion introduced by Friedrich Schelling and taken up by Max Mueller, to describe religious systems which recognize many divinities but where one is supreme above all the others and perhaps subordinates all the others as mere manifestations of himself. The servant of the Arab Sun God, al-Shams, presumably worshiped his namesake. But he made this inscription in the name of the supreme Creator-God, Allah. The Qur’an depicts part of Muhammad’s prophetic mission as convincing his compatriots that there were no such things as daughters of God or deities who shared in God’s divinity. There is only God. There is a story in the biographies of the Prophet that he and the Quraysh of Mecca made a peace treaty at Hudaibiya in 628. Muhammad wanted to begin with “In the name of God, the Merciful, the Compassionate.” The Quraysh did not recognize this diction, and wanted to write simply, “In the name of God.” That is the diction of this inscription. The temple that the Thamud made to God with Roman encouragement is analogous to the Kaaba, the cube-shaped shrine to God in Mecca, in the 500s and 600s. The Thamud at Rawwafa were not monotheists, but his particular temple was dedicated to God (Allah/ Theos) rather than to any of the other deities in their pantheon. About 450 years separate the Rawwafa inscription from the Qur’an, which also attests pagan Arab worship of God, but in Arabic. Mohammed Abdullah Alruthaya Almaghthawi (@Mohammed93athar) suggests that this inscription could be that of a historical person known from the later Muslim sources, `Abd Shams b. al-Mughirah b. `Abdullah b. `Umar al-Makhzumi al-Qurashi, who is mentioned in Ansab al-Ashraf (Genealogies of the Noble). If that is he, Arabic Wikipedia says his father would have been al-Mughirah ibn ‘Abd-Allah ibn `Umar ibn Makhzum ibn Yaqza ibn Ma`ra ibn Ka’b ibn Lu’ay ibn Ghalib ibn Fihr ibn Malik ibn Quraysh. Al-Mughirah is said by the later sources to have died in 609, a year before Muhammad received his prophet commission, and had been instrumental in the rebuilding of the shrine to God, the Kaaba, in 605, four years before his death. He was perhaps the wealthiest male merchant in Mecca, and paid a substantial portion of the costs of the rebuilding of the shrine. Al-Mughira was born in Mecca, about 40 years before the Battle of the Elephant (when Abraha of Yemen tried to conquer the Hejaz, an event I date to 567, which would give his birth date as 527). He is said to have participated in several Arab battles. After the prophet Muhammad began openly preaching around 613, the Makhzum clan proved one of his biggest enemies, being according to the later sources especially wedded to their pagan religion. Of course, the identification of the author of this inscription as the son of al-Mughirah is only a suggestion, though a plausible one. If it is correct, this inscription might be the first to be found by a member of the clan Makhzum of the tribe Quraysh. And if it is sixth century, it is the only contemporary witness to pagan Arab worship of God besides the Rawwafa inscription and the text of the Qur’an.